UPDATE: Check out the translated pages here! Thanks, Midori! 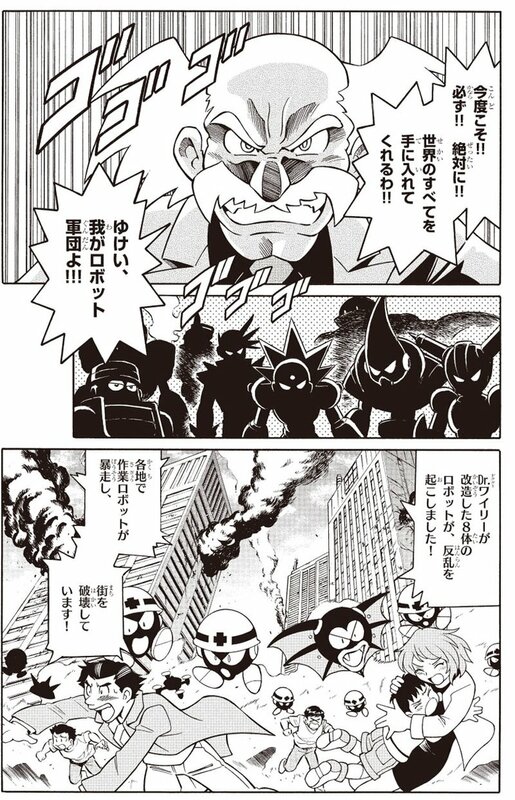 By way of Rockman Unity, here's a few pages from the recent Rockman 11 one-shot manga by Ryo Takamisaki. 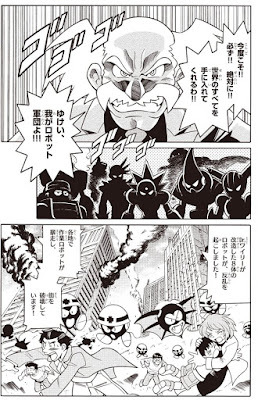 These pages appear to cover the game's initial moments: Dr. Wily's army wreaking havoc upon a city and Dr. Light imparting the tale of the Double Gear system to his children. 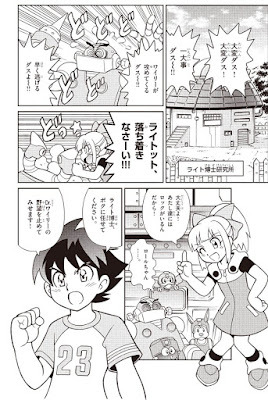 The 26-page, single chapter story is now available to read within the pages of September's Coro Coro Aniki. You can order the issue from Amazon Japan here. There are no current plans for additional chapters nor an official English-language adaptation. I'm more than positive a scanlation will appear down the road, though. Stay tuned! That dude in the crowd getting attacked by a bunch of enemy robots in the bottom far left looks like Krillin from DBGT. Uh no. It's a common technique to draw less details on extra characters for a spread page. By that logic, everyone drawn like that looks like Krillin. He doesn't look like Krillin cause of lack of detail, he just looks like Krillin. Looks like a generic guy with gray hairs to me. Seriously original Anon, don't make a big deal out of something so irrelevant. 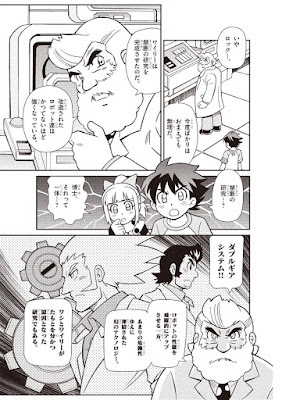 Young Wily and Light look like they're drawn in a very Astro Boy like style, I love it! Young Light and Wily look like they're drawn in a very Astro Boy like style, I love it! Here is a tentative translation! Finally! It looks as if we will receive a much deeper story than previous titles have done. This just boosts my excitement even more! I want more interesting and compelling stories for future MegaMan games. So you're suggesting that Capcom should screw the idea of attracting new fans and just stick to pleasing the dwindling older fans who are "getting too old for this". Where have I heard that before? Oh that's right, during the 1990s during the Dark Age of Comic Books. 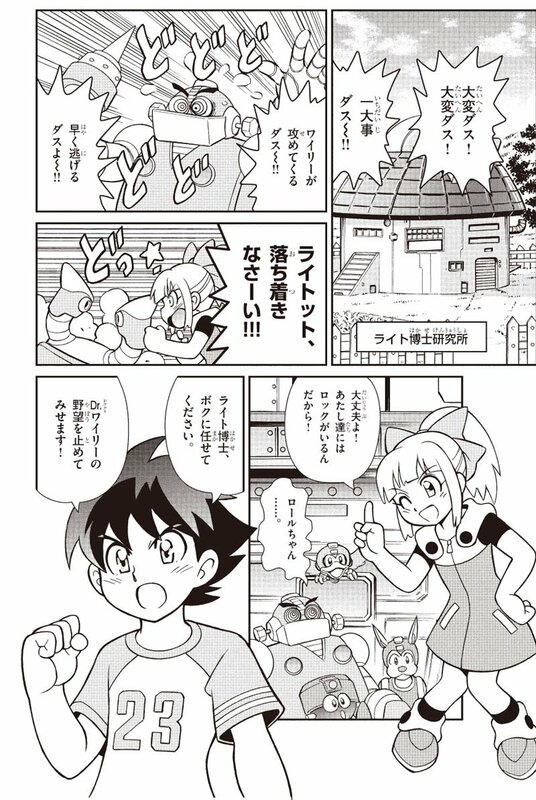 Young Wily is looking really cool in Takamisaki's art!! That Fuse Man talked a lot like a maverick. Is Willy allowing more free will on his robot masters?